Live in packs of up to 42 but also survive alone. Survive in forests, prairies, tundra, mountains, deserts and swamps of the Northern Hemisphere. Weigh as little as 29 pounds in the desert of Israel and as much as 172 pounds in the Northern tundra. Tolerate temperatures from minus 70 to plus 120 degrees Fahrenheit. Prey on large mammals living near them and eat fruits and berries too. Travel more than 43 miles in a day. Run at 34 to 38 miles per hour. Swim up to eight miles. Wolf down as much as 22 pounds of food at a time. Fast for months if necessary. Repopulate suitable areas with remarkable success - if given half a chance. Thrive in areas with high human density such as Europe and Asia. Live up to 13 or more years in the wild - if all goes well. Speak up for their protection as an endangered species. That's up to us, and the battle is on. 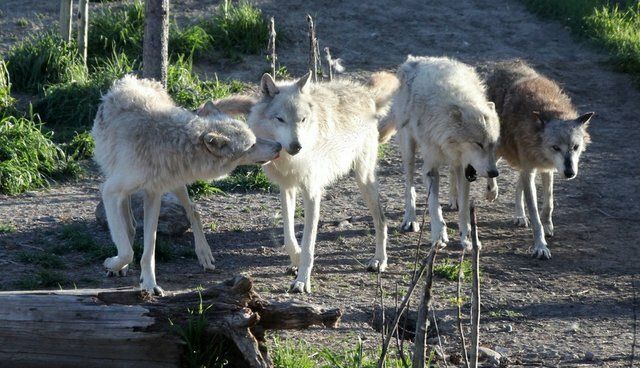 Politicians in Washington are conniving to pass two bills that would strip wolves of protection under the federal Endangered Species Act. More than 50 world-renowned scientists, representatives of five Native American tribes, 24 business leaders and 82 organizations sent letters to Members of Congress asking them to oppose that legislation. "The best available science indicates that the gray wolf occupies a mere fraction of its historic range and therefore has not yet recovered from centuries of systematic persecution." "Wolves in states that no longer have federal wolf protections have been subjected to increasingly hostile state management practices."